Strip them from your diet completely. Eliminate the most common craving-inducing, blood sugar disrupting, gut-damaging, inflammatory food groups for a full 30 days. Let your body heal and recover from whatever effects those foods may be causing. Push the reset button with your health, habits, and relationship with food, and the downstream physical and psychological effects of the food choices you’ve been making. Learn how the foods you’ve been eating are actually affecting your day-to-day life, long term health, body composition, and feelings around food. The most important reason to keep reading? I cannot possibly put enough emphasis on this simple fact—the next 30 days will change your life. It will change the way you think about food. It will change your tastes. It will change your habits and your cravings. It will restore a healthy emotional relationship with food, and with your body. It has the potential to change the way you eat for the rest of your life. I know this because I did it, and millions of people have done it since, and it changed my life (and their lives) in a dramatic and permanent fashion. Some specific foods that fall under this rule include: pancakes, waffles, bread, tortillas, biscuits, muffins, cupcakes, cookies, brownies, pizza crust, alternative flour pastas, cereal, or ice cream. No commercially-prepared chips (potato, tortilla, plantain, etc.) or French fries either. 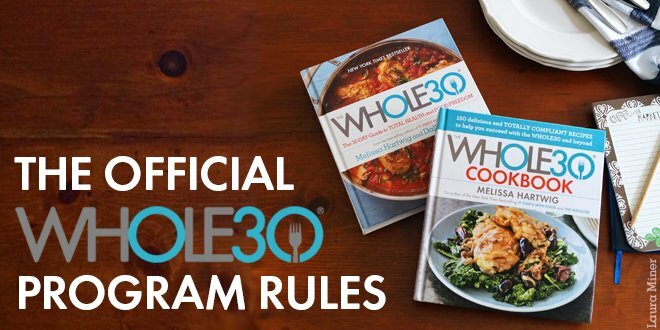 However, this list is not limited strictly to these items—there may be other foods that you find are not psychologically healthy for your Whole30. Use your best judgment with those foods that aren’t on this list, but that you suspect are not helping you change your habits or break those cravings. Our mantra: When in doubt, leave it out. It’s only 30 days. Coconut aminos. All brands of coconut aminos (a brewed and naturally fermented soy sauce substitute) are acceptable, even if you see the words “coconut nectar” or “coconut syrup” in their ingredient list. This is not hard. Don’t you dare tell us this is hard. Fighting cancer is hard. Birthing a baby is hard. Losing a parent is hard. Drinking your coffee black. Is. Not. Hard. You’ve done harder things than this, and you have no excuse not to complete the program as written. It’s only thirty days, and it’s for the most important health cause on earth—the only physical body you will ever have in this lifetime.